The anniversaries are coming thick and fast at the moment and it is not always possible to mark them on time. In the course of a busy week zipping up and down the country last week, I nearly missed this one. 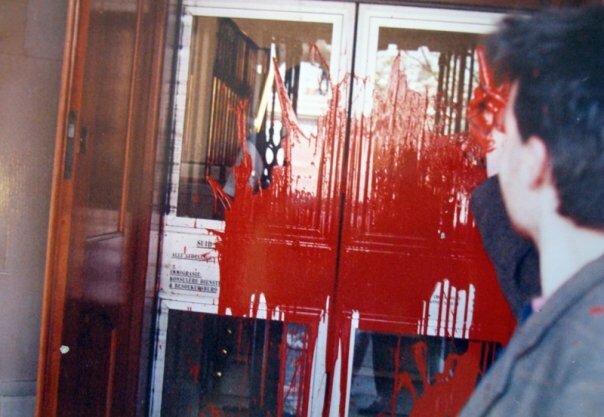 On 23 March 1988, a City Group activist Adam Bowles was sentenced to 14 days in Brixton Prison for his part in throwing a large amount of red paint over the doors of the South African Embassy on the day of the whites-only election in South Africa the previous May. Adam was sentenced at his second trial. At the first, the jury refused to convict him and his co-defendants. The United Nations has proclaimed that the South African constitution is null and void and any elections within these territories is null and void… What we are talking about is three people… taking action to stop the phony, proxy, so-called elections. The three defendants attempted to call a series of expert witnesses to attest to the crimes of apartheid and, specifically, the involvement of the London Embassy in illegal arms dealing and the bombing of the ANC offices in London in 1982. Judge Morland would not allow these witnesses – the journalist David Leigh from The Observer; Gora Ebrahim, a leading member of the Pan-Africanist Congress of Azania; and Norma Kitson, who was to talk of her own experience of being detained and tortured in South Africa – to speak. Following the jury’s guilty verdict, Judge Morland summed up the case by acknowledging that Adam, Liz and Irene were “of the highest moral and political character”. Nevertheless, he fined both Liz and Irene, giving them two-year conditional discharges, and imprisoned Adam for two weeks in what he hoped would be a punitive deterrent. On the Saturday morning after Adam’s imprisonment, City Group held a loud solidarity protest outside Brixton Prison where he was being detained. Although the protest started, visibly, outside the main entrance to the prison, it also marched around the perimeter of the jail to points where is was more likely that the prisoners, Adam included, might hear it. Indeed there were reports of shouts of ‘Viva!’ and “Free Mandela!” drifting back at them over the prison walls. Everyone in the prison had heard on the radio why I had been convicted. They were very supportive and told me what my basic rights were. I received cards and letters from all over the country and would like to thank everyone who sent them. They were a tremendous morale boost and helped me get through my sentence. On Sunday I went to Mass and was quickly told by many of the prisoners about the loud and vibrant demonstration outside the jail. The picket of Brixton Prison certainly made its mark! Adam was one of only a very small number of City Group supporters who were jailed during the Non-Stop Picket of the South African Embassy in the late 1980s. They all received the type of solidarity and support that he did. As I have pointed out in a number of previous posts, for City Group, solidarity was not just something that they extended across distance to those fighting apartheid in South(ern) Africa, it was also offered close to home to those arrested in the course of practicing their anti-apartheid solidarity. But also City Group’s solidarity was frequently reciprocated – as can been seen in the fact that a senior member of the exiled leadership of the PAC was prepared to testify at Adam’s trial. In an interesting twist to the story, Adam had been unemployed at the time of the paint throwing action. As a result of how he conducted himself at trial, he so impressed his barrister that he was offered a job in chambers as a barristers’ clerk. This is just one of the small ways in which the activism of youthful anti-apartheid protesters on the Non-Stop Picket went on to shape their future lives in unexpected ways. This entry was posted in Archival research and tagged City of London Anti-Apartheid Group, Direct Action, Gora Ebrahim, Norma Kitson, PAC, prison solidarity, Solidarity. Bookmark the permalink. From TF ” Erile, Erile mapo…….. erile babu le ya.. erile babu leya,” remember me?